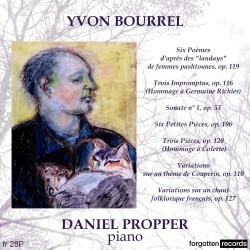 The composer Yvon Bourrel is a name new to me. He was born in Vendegies-sur-Écaillon, a small town tucked away in the north-east corner of France, near the border with Belgium. His father instilled in the young boy an interest in opera, and he received some early piano lessons from his mother. This, in turn, nurtured an interest in composition. An encounter with Darius Milhaud eventually led him to take lessons with the composer as well as with Jean Rivier. After a working life teaching, he retired in 1993. As far as I can ascertain this is the only recording available of Bourrel’s music, though his compositional oeuvre includes, not only piano works, but three symphonies, twelve concertos, ten string quartets, trios for various instruments, a requiem, an oratorio and some songs. My colleague Jonathan Woolf, who reviewed this release in November, elaborated on some of the background to the music. I will just share some of my thoughts on some of the pieces that particularly grabbed me. On the evidence here, Bourrel is the miniaturist par excellence and none of the individual pieces on this release lasts for more that six minutes, the majority for only one to two. The music embodies a wealth of melodic invention, the booklet notes suggesting that Milhaud’s influence on the composer is revealed ‘in the importance he (Bourrel) attached to the quality of musical phrases and in the quest for melodic continuity’. I’m particularly drawn to the Three Impromptus Op. 116 (2003), which are delightfully evocative depictions of the female body sculptures of Germaine Richier, who inspired the triptych. In no. 1 we hear the hurricane (L’Ouragane), graphically portrayed. In No. 2 (La Jeune Fille à l'oiseau) the music is depicted with avian figuration, and in no. 3 (L’Eau) there’s a fluidity in the writing. Another famous woman receives a tribute in Trois Pièces (Hommage à Colette), Op.120. Sidonie-Gabrielle Colette (1873 –1954) was a French novelist nominated for the Nobel Prize in Literature in 1948. The first piece makes reference to the regional songs of Burgundy where Colette was brought up. The third piece Palais-Royale, makes reference to the splendid area of Paris, where she spent her last days. The two sets of Variations (Op.110 and 127) are tuneful, well-crafted, and display ingenuity and compositional flair. Propper characterizes each of the variations with tremendous skill and imagination. They’re an absolute delight. These works receive convincing performances from the Swedish-Austrian pianist Daniel Propper, who proves to be a persuasive advocate of these captivating scores. Interesting and informative booklet notes by Marc Vignal in French and English provide not only a biographical portrait of the composer, but a commentary on the music featured. Beautifully recorded in the warm and intimate ambience of the Forgotten Music Studio, Rennes, this is music that deserves to be heard.